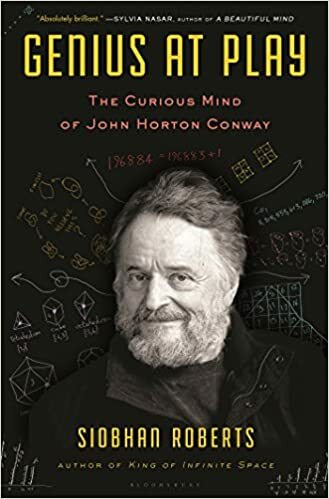 Back in January I mentioned that I had been enjoying Siobhan Roberts’s new biography, Genius at Play: The Curious Mind of John Horton Conway. I finally finished it, and can now officially say that I really enjoyed it. This is not a conventional biography. It is all jumbled together, verging on stream-of-consciousness—anything but chronological. In places, Roberts simply quotes Conway at length rather than trying to explain. But then again, John Conway is not a conventional human being. The biographical style fits him. Sometimes, reading a biography can be inspiring, as you read about a person who has achieved extraordinary things. Even if you could never achieve the same things, you still come away with effective habits to emulate, insights to ponder, or perhaps even the new realization that you can achieve the same things if you just work hard enough. This is not that sort of biography. Through Roberts’s portrait it becomes clear that there are no conscious habits to emulate, no insights to abide by—the only way to be like John Conway is to be John Conway. And there is only one John Conway. I learned a bit of new math from the book; got inspired to re-learn the Doomsday Algorithm (my current average is about 12 seconds per date); and gained a new appreciation for the various ways that Conway’s interests weave together and for the scope of his career. Mostly, though, I got a fascinating glimpse at a strange and wondrous life. I certainly didn’t come away from the book inspired to be like Conway. But I am thankful and amazed that he exists. This entry was posted in books, people, review and tagged biography, book, Conway, review. Bookmark the permalink.